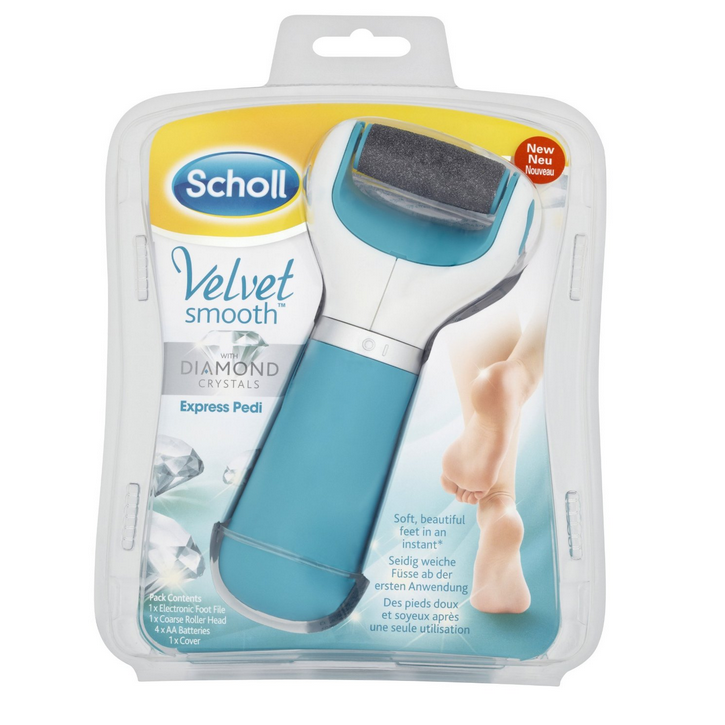 Scholl Velvet Smooth Pedi represents the second generation of Scholl hard skin removers. This Scholl electric pedi can be used both by men and women, quickly and effortlessly. I hope that my Scholl Velvet Smooth review will give you a deeper insight into the product and everything there is to know about it. The hardened skin (known as callus) that forms around the heel area can be very bothersome and unsightly, especially for ladies. This is why having a professional, efficient yet gentle callus remover is essential for those who want to have healthy and beautiful feet, no matter if they are at home or on holiday. This high-quality hard skin remover by Scholl is a battery-operated one. It comes with an ergonomic design and an easy-grip handle. The device is hassle-free and it can be safely used at home, as it removes the callus within minutes. Its micraumina head can be easily replaced when it is no longer efficient. The Scholl Velvet Smooth is designed to be easy and effortless, however, it must be used only on dry skin and only on your feet. All you have to do after you have thoroughly cleaned your feet is to turn on this device and to use it to delicately buff away the hardened skin. The result: smooth, good-looking legs that feel fresh and that are also very pleasant to the touch. The package includes the callus remover as well as 4 AA batteries. Performance – the most notable benefit of this callus remover by Scholl is that it is compact, lightweight and designed to gently buff away the hardened skin. You can quickly see that its performance is clearly better than the first generation of Scholl hard skin removers. Portable – it fits perfectly into your purse or luggage, and it can be easily taken with you wherever you go. In addition to this, the product is also very versatile and it can be used by anyone, regardless of age or gender. Design – the Velvet Smooth pedi series by Scholl features very stylish and practical design. It has a removable head that is easy to clean. Stops if too much pressure – the device tends to stop when you put pressure on it, although it is designed to be more efficient than the regular foot file. Scholl explains this as a safety measure since too much pressure may jam the motor, which can be a downside for those who have very thick callus that needs to be removed quickly. Additional rollers need to be purchased separately – Scholl does not provide additional free rollers, which its competitors do offer. It is essential not to use it in the same area for more than few seconds at a time, otherwise you risk to remove not only the hardened skin, but also the healthy one, and this may result in soreness and inflammation. Moreover, the electric pedi should not be used on injured or irritated skin, and it must never be submerged in water. Those who suffer from diabetes or poor blood circulation are advised not to use this hard skin remover. To sum it all up, this Scholl pedi is a simple, efficient and cost-effective device that can turn out to be a great choice for those who want to look good all the time, without going to the spa or salon. Our feet deserve all the attention they can get, especially during the summer months, and every pedicure should start with a gentle callus removing session. Scholl Velvet Smooth Pedi is the second generation of Scholl hard skin removers. It is a simple, efficient and cost-effective device that most buyers will love. I bought this product as I suffer from hard skin and enjoy having my feet pedicured from time to time. A friend reccomended the Scholl Pedi to me so I thought I would give it a go. It’s so easy to use and the handle feels great in your hand. The dry hard skin just came straight off and left my feet feeling so smooth. I now make this a weekly treat for my feet, it’s fantastic!!! The file head is also open which makes it very easy to use as you can acess all angles unlike some of the other products I have seen which is definitely a benefit. I have also been using the the Velvet Moisturiser that comes in the range and this adds a lovely soft feel at the end! LOVE IT! If you feel like treating your feet to some endulgence I would definitely reccomend this product! Oh – wow! Why didn’t I buy this before? A bit noisy but SO effective! Recently my stockings were laddering on my horrible feet – so VERY happy .